Papaya is loaded with antioxidants, high in fiber, rich in Vitamin A C & K and they supports the immune system. They are anti-inflammatory and it contains the digestive enzyme called papain. 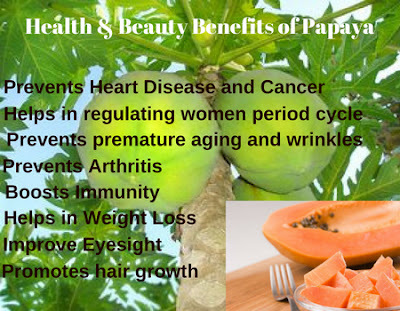 Papaya is low in cholesterol, so even diabetes patients can safely eat this with no doubt about increase in weight or sugar levels. Regular consumption of papaya juice can increase digestion, helps to increase metabolism and boosts the immune system. Digestive disorders have a direct effect on the quality of life. Digestive disorders include heartburn, bloating, diarrhea, constipation, gas, stomach pain, and stomach cramps. Hence papaya is used as a natural remedy in abnormal digestion in tropical and industrialized nations. Papaya consumption is suggested for weight loss and dietary measures. Eating papaya generates a feeling of fullness and stops hunger. Rich in dietary fibers, promotes metabolism and low cholesterol, the papaya is a safe bet for those weight watchers!! Consuming this fruit regularly helps to increase the calcium level in our body. This will certainly postpone the occurring of arthritis. Papaya also aids wound healing which may get infected if not cared for properly. Papaya has traditionally been used to treat various skin disorders, including wounds. Wounds can be cured by applying crushed papaya seeds on the open wound. Elevated triglyceride and LDL cholesterol levels can increase your risk of heart disease, such as heart attack and stroke. Vitamin A, C and K presents in papaya, so adding more papaya to your diet helps to control cholesterol and reduce the risk of such heart diseases. A young and healthy heart is what everyone wants to carry on with their responsibilities endlessly. When affected by Dengue fever, the platelet count is decreased. Papaya leaves extract is a good remedy to increase the platelet count. Crush a few green papaya leaves and extract the juice to revert low platelet counts to normal in dengue fever. Papaya is recognized for its role to building a strong immune system. Women who is facing abnormal menstrual cycles, are advised to eat this fruit regularly for a natural flow of menstruation. Consuming papaya helps to clear the inflammation in the lungs and promotes relief from asthma. Eating Papaya is highly recommended for its powers to keep cancer at bay. Its antioxidants properties prevent cells radical damage and promotes immunology and stops the spread of cancer. Degeneration of vision due to age can be prevented by consuming this angel fruit-papaya. Rich in Vitamin A, papayas are a highly recommended for an improved eyesight. A frozen bowl of fresh cut papaya on a hot summer afternoon, can be the energizer that you so much want. Also, a cup of papaya fruit, as a break time snack can reduce the stress levels during a long working day. A papaya hair mask made from papaya pulp crushed and mixed with fresh yogurt, applied on the hair and rinsed with a mild shampoo, is found to be effective in dandruff control. Now you know the benefits of Papaya!!! This is why Papaya is called "Fruit Of The Angels"